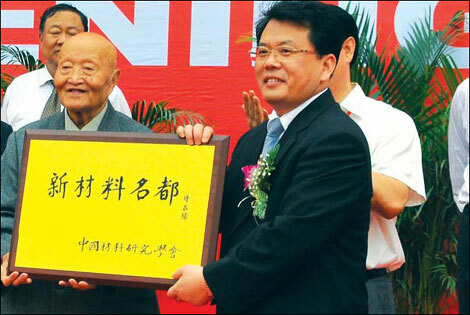 Prominent scientist Shi Changxu (left) presenting a plaque to Zibo's Party chief, Liu Huiyan, on behalf of the Chinese Materials Research Society, proclaiming Zibo a 'New Materials City'. Zibo's new materials industry saw robust growth throughout 2010, thanks to the city's effort to develop high-tech industries, especially new materials. The sector has 561 related enterprises and had an industrial output value of more than 181 billion yuan last year. 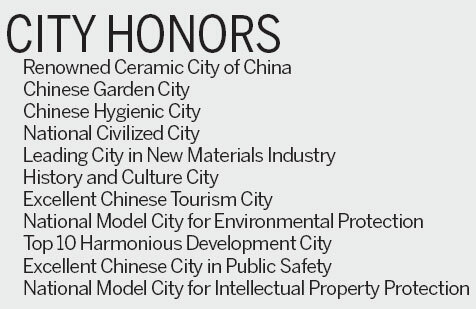 Thanks to that, Zibo was declared a New Materials City by the Chinese Materials Research Society, in September 2010. Actually, this started much earlier. Back in 2002, the Ministry of Science and Technology had already designated the city as a new materials commercialization and industrialization center. Now, after almost a decade of growth, Zibo has several new material areas focusing on advanced ceramics, new chemical materials and heat-resistant products. In the chemical materials sector alone, it has 188 enterprises with various products, a number of which have the largest market share for their type in China. Some analysts have said that the city's production capacity for pollution-free refrigerants, plastic agents and fireproof fiber are in the lead in Asia. What is driving the boom in new materials is a large amount of investment in R&D. The city has 70 research centers and enterprise technology centers, five of them at the State-level and 50 at the provincial-level, as well as 11 post-doctoral research sites. A number of its companies and institutions own the intellectual property rights to key technologies and products. For instance, in the ceramics industry, companies have at least 200 patents, three of them at the State-level. The products covered by these patents cover a wide range, such as the aerospace, defense, and nuclear energy sectors. The city has cultivated several leading brands, including Huaguang, a leading name in household chinaware. The Great Hall of the People, on Tiananmen Square, the Diaoyutai State Guesthouse, and Zhongnanhai - the central government complex - have used its high-purity quartz products for several years. In addition, low-iron glass products from Zibo's Jinjing Group have been used on Trains on the Tibet line and at a number of Beijing Olympic facilities, such as the Bird's Nest and the Water Cube. Its window glasses see wide use in many landmark buildings. Another contributor to Zibo's new materials development is the annual China (Zibo) International New Materials Technological Forum, which opened in 2002. This is a forum for sharing the latest technological innovations and has given both the city's economy and its international reputation a great boost. The last nine forums attracted a large number of academics and industry professionals from more than 30 countries and, witnessed the signing of 5,155 technological project agreements.